For purposes of this article, Australia, New Zealand plus the Pacific Islands combine to form the economic region known as Oceania. From a practical standpoint, only Australia and New Zealand are looked at seriously by global investors. The Pacific Islands are small in size with limited natural resources, narrowly-based economies, large distances to major markets, and vulnerable to external shocks; all of which can affect growth and have often led to a high degree of economic volatility. Australia and New Zealand combine to account for 97% of total GDP in the region. Papua New Guinea, an island just north of Queensland, Australia accounts for 2% ($28 billion USD) of Oceania’s GDP and the remaining 1% is accounted for by the Pacific Islands. Interestingly Pacific Island countries (excluding Papua New Guinea) have a population of about 2.3 million people, spread across a unique and diverse region made up of hundreds of islands, and scattered over an area equivalent to 15 percent of the globe’s surface. Fiji is the largest country of the group, with a population of around 900,000. Tuvalu and Nauru, with estimated populations around 10,000 each, are the World Bank Group’s smallest members by population. Kiribati is one of the most remote and geographically-dispersed countries in the world, consisting of 33 coral atolls spread over 3.5 million square kilometers of the ocean; an area larger than India. Which South Asian Countries Offer the Best Investment Opportunities? 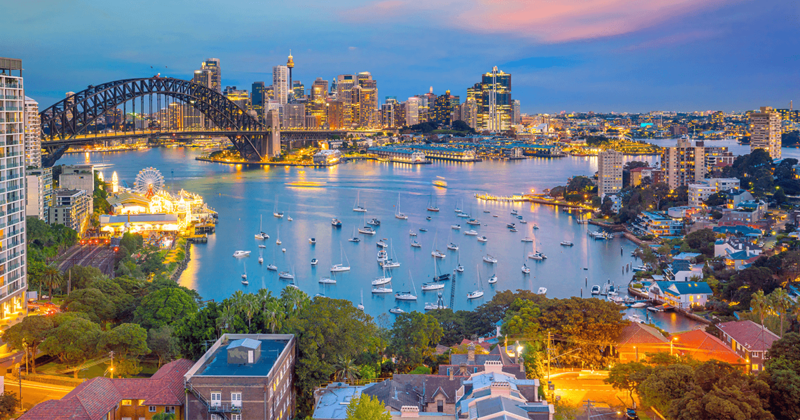 Following two decades of steady and continuous growth, low unemployment contained inflation, very low public debt, and a strong and stable financial system, Australia’s GDP is projected to trend around 1720.00 USD Billion in 2020. The services sector is the largest part of the Australian economy, accounting for about 70% of GDP and 75% of jobs. Australia was comparatively unaffected by the global financial crisis as the banking system has remained strong and inflation is under control. With its “Big Four”, (Commonwealth Bank, Westpac, National Australia Bank and ANZ), Australia has an extremely valuable asset in the current troubled banking world. All four are ranked in the World’s 50’s safest banks. The metal and mining industry continues to be an important industry for Australia. Despite global financial malaise, the mining industry continues to be a steady source of income. Coal, iron ore precious metals, gemstones, oil & gas production, salt, limestone and many other variations of mining are important to the overall stability of Australia’s economy. Australia is the world’s largest net exporter of coal accounting for 29% of global coal exports. With its vast natural resources supply, Australia survived the global economic crisis. Active mining areas include Queensland, Victoria and Western Australia (Pilbara). Meat and livestock are another major industry in Australia. Roughly 53% of Australia’s vast land is considered to be “agricultural”; 88% of that land is permanent pasture. The Australian cattle and sheep industry injects more than $16.95 billion into its economy each year and employs more than 200,000 people. Australia is among the world’s largest and most efficient producers of commercial livestock and a major exporter of red meat and livestock. The Australia red meat processing sector produces beef, lamb, sheep meat and goat meat for domestic consumption and export. The non-red meat processing sector also makes products such as leather, toiletries (soap, cosmetics, deodorants, etc. ), candles, plastics, oils and more. New Zealand’s GDP grew by 2.30% in 2019 after 2 consecutive years of 3% growth. A strong recovery in business investment, ongoing strength in tourism and the recent increase in dairy prices should support growth in the coming years. Rising real estate prices have increased household wealth and consumption. They have also stimulated residential construction activity, particularly in Auckland. The activity has surged at double-digit rates in recent quarters. Tourist arrivals were about 50% higher in 2019 than they were 5 years ago. This increase is due in large part to Chinese visitors. Housing investment in New Zealand has increased from 4% of GDP to 7% of GDP over this same 5-year period. For some time now, New Zealand has been a global renewable energy and energy efficiency leader. The share of renewable energy in the country’s power mix increased to 80.2% and the country is hoping to increase that to 90% by 2025. Achievement of these goals is likely to rely on a stable contribution from hydro generation; further expansion in a geothermal generation; investment in generation from the wind; and continued growth of the residential solar PV market. Although this energy is intended to support the local economy solely, the result will be to reduce industrial and household costs, thereby enabling additional investing and domestic spending. This, in turn, will support growth in other economic sectors. New Zealand is rich with natural resources including natural gas, iron ore, sand, coal, timber, hydropower, gold, and limestone, so mining is also a key industry. New Zealand is the largest global exporter of dairy products, kiwi fruit, lamb and venison, and a major exporter of beef, apples, seafood, and wine. In fact, the food and beverage industry employs nearly 20% of all New Zealand workers. Of the food and beverage area, wine is a target growth area. In 2016 New Zealand exported a total of $1.2 billion USD. International success to date has been built almost exclusively on Marlborough Sauvignon Blanc, which has become a “must-have” wine for major wine players. However good the Marlborough wine area is, the area’s grapes are now almost all used. But investors should fear not. Emergent secondary regions are 20 years behind Marlborough in terms of development. Hawkes Bay, Waipara and Central Otago stand out as the next best prospects. According to the World Bank’s “Ease of Doing Business Index”, Australia and New Zealand are considered quite favorable business climates for foreigners to expand their business globally; for 2 straight years, New Zealand holds the top (“easiest”) position. In 2019 Australia is the 15th easiest country to conduct business. The Pacific Islands are all seen as difficult countries for doing business. Contact us at Blueback Global for assistance with conducting your due diligence and other services associated with expanding your business in Oceania.